Your baby is the most precious thing you own and you always want to make sure that your baby gets the best of everything. Swings are essential for any new parent for their baby. Without swing, getting the baby to sleep is extremely difficult. And to make them feel better you swing them in your arms. But doing this for long times make your arms tired. So, how to deal with it? Here is good news for you. 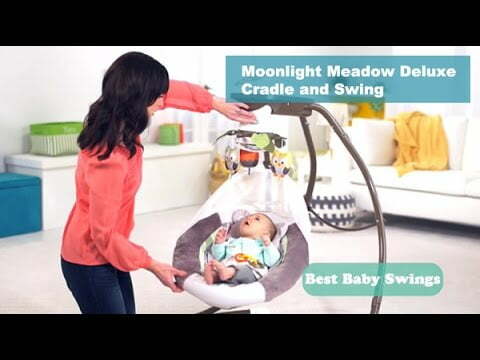 Here is a review to choose the best baby swing called “Moonlight Meadow Deluxe Cradle and Swing” and help you buy a perfect baby swing on online. The model comes with long life batteries and a swing timer as well as a soft cushioning for the baby using natural fibers. Moonlight Meadow Deluxe Cradle and Swing is easy to switch from one swing motion to another, just push a button and turn the seat. It is actually sense baby’s weight and it starts without a push. Usually is up to 25 pounds. So it is easy to carry from one place to another place of home. Multi speeds for the swing functions. The swing has two-way motion options from head to toe just like a traditional swing and side wise direction cradle like motion. Six-speed options to choose the speed for your baby. It has 16 song options and soothing sounds to provide a pleasant environment for the little baby and keep him entertained. 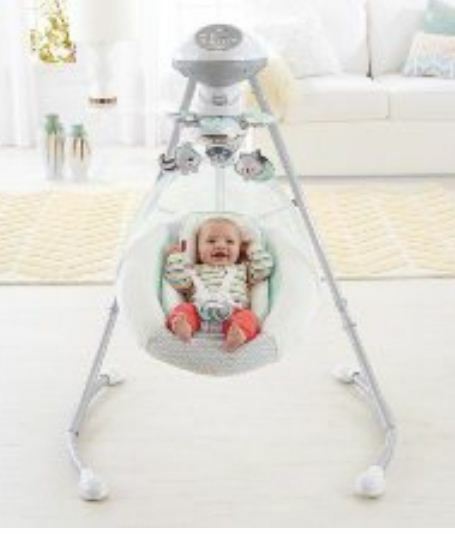 The positive think of the Moonlight Meadow Deluxe Cradle and Swing is high rated baby swing from customer review. you can see here. Most of the people who have used the product have found it an amazing one. It has 3 adjustable seat positions, they are right-facing, center-facing and left-facing. It is very safe and comfortable. Provides sources of providing power. You can either choose to put in 4D batteries or plug it into an AC power source whatever is convenient for you. The motorized mobile with 16 songs and soothing nature sounds helps to calm and keep baby entertained.And just buttons make it easy to change swing positions. 1.Question: Is it possible to seat turn so it can go back and forth motion? Answer: Yes it goes side to side and front to back. Parents are very happy with this swing.And the Best swing ever! 2.Question: Is the swing washable? Answer: Yes, It is machine washable and dryer safe. 3.Question: Does this require an infant insert? Answer: No, It is perfect, easy and comfortable, soft padding all round and perfect. 4.Question: What age a baby stop using this swing? Answer: Depends on your baby. On average the time could be 8 months. And someone also likes up to 1 year. 5.Question: What is the size of the chair approximately? Answer: The bucket part of the chair itself is about the same size as an average rear facing car seat. The Fisher-Price Moonlight Meadow Deluxe Cradle and Swing is in reasonable price and provides a plush deep seat and your baby will love and entertained with music and nature sounds, and soothing vibrations that will have your baby drifting off to dreamland within minutes. On the other hand there’s a removable toy bar with plush toys for your baby to enjoy while awake as well. Soft, comfortable with two cradle and swing motions and a variety of many features let you choose and combine what baby likes best! It has six-speed options, thus you can choose the speed for your baby. want enjoyment, as this this site conations truly pleasant funny data too. Thank you so much with regard to giving us an update on this matter on your web page. how to make good using of those techniques you talk about. Thanks for your time and consideration of other individuals by making this website available. of most recent aand earlier technologies, it’s remarkable article. type of space . Exploring in Yahoo I eventually found this website. internet site and give it a style regularly. mention that We have truly enjoyed browsing your weblog posts. In any event I am going to be subscribing in your feed and I’m hoping you write again soon!